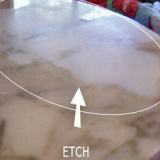 What Is A Color Enhancer for Travertine Marble, Granite, & Other Natural Stones? It's a product that enhances the color of your stone. 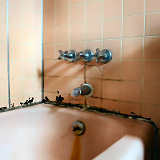 It deepens the color of your granite, travertine, marble or other natural stone by giving it the wet look. Add shine and depth to your stone. Obtain a more polished or finished look on rough surfaces. Camouflage scratches on non polished stones. Match edges to the surface of your stone. 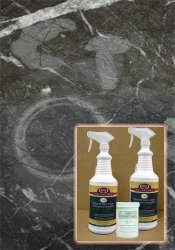 Use it on granite, travertine marble, limestone... all non polished stone surfaces. 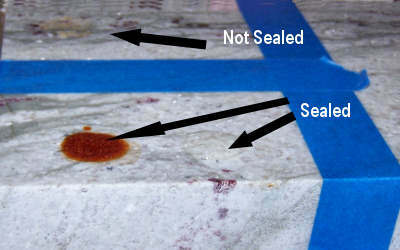 Sometimes a color enhancer can be used on polished surfaces. But, it's quite a bit more noticeable on honed, flamed, leathered, antiqued, tumbled, satin, brushed or rough finishes. Use it on vertical or horizontal surfaces such as counter tops, back splashes, vanities, showers, fireplaces, and floors. Use it on rocks and grout. Use it inside or out. It lasts longer on interior surfaces than exterior surfaces. It lasts longer on counter tops & vanities vs. floors. We applied the color enhancer to a heavily trafficked (residential) interior slate floor. It lasted about 3 years before we reapplied it. You'll notice over time that the deepness of the color fades - nothing drastic. We also enhanced a few boulders sitting outside. The enhancer has lasted through three Minnesota winters so far. The color has faded but the boulders still don't look as dry and dusty as they did before applying the enhancer. 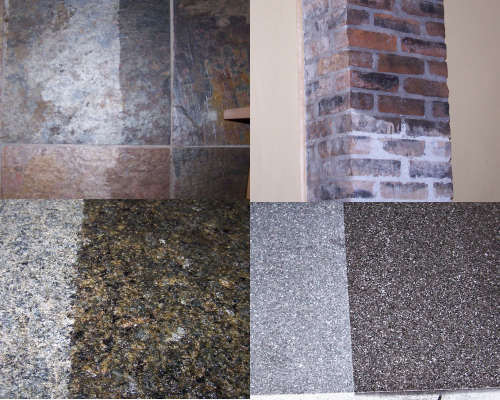 How Do I Use A Color Enhancer for Granite, Travertine Marble & Other Natural Stones? 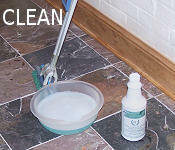 Clean your surface with a cleaner for counters or stone floors. 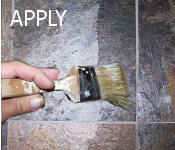 Apply the enhancer with a rag, paint brush, roller or sprayer. Let it sit 5 minutes or so. You want it to penetrate into the stone. 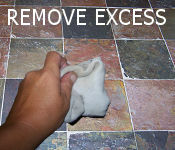 Then wipe off any excess. 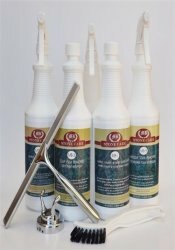 Before purchasing an enhancer, get your stone wet. Like the color? This is how your stone will look once it's applied. 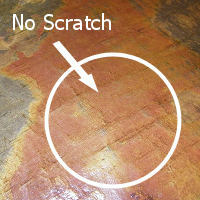 Apply the enhancer BEFORE any sealer. Very Important! Feel sticky after applying? Give it a day or so. If it still feels sticky - use a little more enhancer or mineral spirits to remove any dried or excess enhancer from the surface. Need a straight line? Use blue painters tape. This will also keep the enhancer where you want it. How Long Does An Enhancer For Stone Take to Apply? - walls, counters, floors etc. Typically, an hundred square feet of floors will take about 1 hour. Yes. The colors will POP! We tested the color enhancer on a slate floor. We wanted to see if there was a huge difference in color, if it could camouflage scratches and how long the enhanced look lasted. Cleaned the slate with stone floor cleaner. Applied the color enhancer with a paint brush. Let the enhancer set overnight. Applied another coat of enhancer. 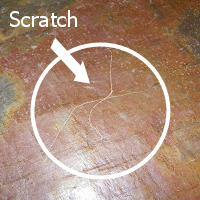 We then took a key, scratched the floor and reapplied enhancer on just the scratched tile. The difference was incredible! The slate went from dusty and drab to deeper and darker. Did The Color Improve? YES! The blacks became a deep charcoal instead of dusty gray - the greens evened out - the reds, rusts and oranges looked fresher and clean. The colors appeared brighter. YES. It was perfect - no sign of the scratch. Will it work on other stones? It might. Get the area wet. Did the scratch disappear? If so, the a color enhancer will most likely work. It has been 3 years since we applied an enhancer to the slate floor. The color's faded but the slate does not look as dusty as the day it was installed. We recently applied another coat of enhancer and the colors POP once again. We decided to try the enhancer on a few different stones. The enhanced side is on your right. The color enhancer increased the depth of color on all the stones we applied it to. The look changed drastically on every stone. The simplest and least expensive way to know if you'll like how the color enhancer will look is by getting your stone wet. I received the color enhancer and tried it out. It works great. A huge difference! The granite looks deeper and the color is better. ... the countertops look FABULOUS!! The product definitely did enhance the color. I actually ended up using 3 coats. After doing the color enhancer I spilled a couple of things on the countertops, one of them being red wine. Anyway, everything, including the wine, just sat on the top of the countertop and didn't soak in.